It was better than anything I could have expected. When I picked up the dress in the shop, I had no idea whether or not it would fit me okay or if it would be right for where we were going, but I picked it up anyway, feeling pretty good about my purchase and knowing I had some earrings which would match the dress perfectly, and then I simply hoped for the best. When James said he was taking me to ‘Hutong’ at The Shard for our 5th wedding anniversary treat, I was so excited. We’d never been to that particular restaurant before, and I absolutely love The Shard. The dress fit, the earrings matched, everything was great. In fact, I’d even had roses and chocolates delivered to the door hours earlier (something which had never happened on our anniversary previously!) It was safe to say, I felt like I was living my best life. Fine dining and flowers are definitely a winner when it comes to the keys to my heart. Well, I was. At least until we arrived home at 11:30pm and realised that I’d lost my door keys. You see the thing is, James had said before we headed out that he was leaving his keys at home – which would have been fine because I was taking mine. Except now - mine weren’t in my bag. I was so frustrated with myself. James was understandably annoyed, but actually pretty calm about it. I considered paying for an emergency locksmith to come and break into our house so that we’d have somewhere to sleep. James thought that was a bad idea and suggested we go find a hotel for the night. A nice idea in principle, perhaps. But there’s maybe ONE nice hotel within walking distance of our house and surprise, surprise, it was fully booked. 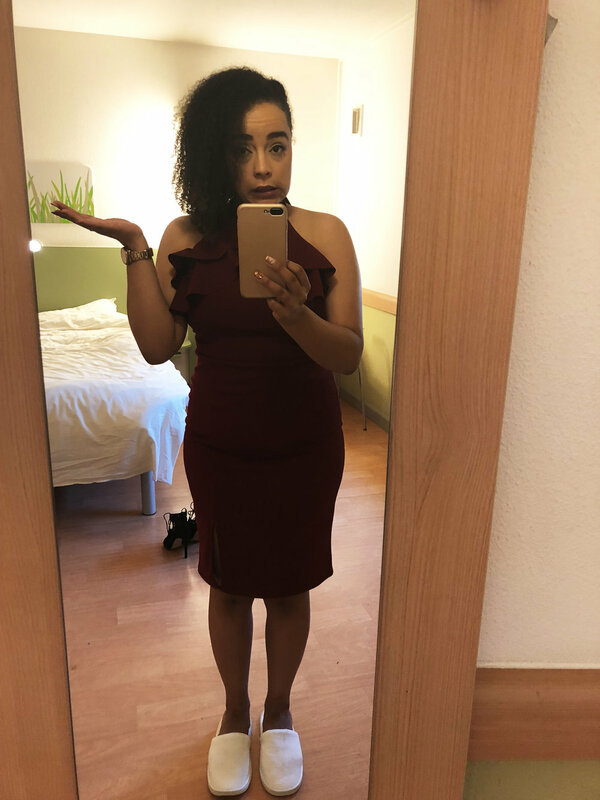 Also – I was in THE DRESS, remember? With the earrings? !… I did not even have a toothbrush on me, let alone a change of clothes. We walked past some local members of our community who commented on how ‘lovely’ I looked, which I didn’t know whether or not to take as a compliment considering I had yesterday’s mascara halfway down my face. At the end of it all though, we got back into our home. And even better – the Uber driver has my keys. Not lost after all. So why do I tell you this long, elaborate (but completely true), potential ‘first world problems’ story? Well, because I still see countless entrepreneurs comparing their first couple of steps with someone else’s 100th step and wondering why they’re not living the laptop lifestyle yet. Let me assure you that with all of ‘The Shard’ type experiences and situations they’re posting now, there will have been PLENTY of ‘Ibis Budget’ scenarios to go along with it. Behind every success, there is a story. Right now, perhaps you’re living yours. Perhaps you’re longing for the highlight reel and the picture-perfect moments? But you’re still stuck on chapter one or two. Don’t lose the lessons you’re learning. Don’t presume that everyone you look up to on the internet must have had ‘a lucky break’. Instead, start recognising that nothing worth having comes easy – especially not at first, and especially not with an attitude of entitlement. Are you willing to work for what you want? Are you willing to go though some pretty challenging moments before you experience what it is that you’re building towards? Are you willing for it to sometimes feel uncomfortable? Now, don’t get me wrong – sometimes things WILL come easy, and perhaps that’ll be the point where you feel you’ve ‘made it’ and take your foot off the gas? That’s part of the problem though. That suggests you’re working only for an outcome and not because it’s your life work and what you’d want to say/serve everyone with even if you weren’t being paid. Haven’t you got more work to do in the world? Aren’t there more people out there whom you KNOW need to hear your message? I’m just reminding you that appearances can be deceiving, and so stay in YOUR lane. Don’t feel resentment or jealousy towards someone’s highlight reel when you haven’t seen their entire camera roll. Back in 2016 whilst I was speaking to a friend about who I was to be charging people actual money for coaching, she reminded me that I’d been doing it for literally YEARS voluntarily. I don’t do this work because I’m aiming for some lifestyle I’ve seen on Instagram. There any so many goals I’ve already reached and surpassed in my business. But I just set new ones. And so, yes, there are a few ‘Shard-like’ moments I get to experience from time to time, but you better believe there’s an ‘Ibis Budget’ behind every single one of them. It meant I couldn’t do my live Sales Success workshop. ‘Why is that a GOOD thing? I hear you cry. Well, because it means it’s still open to you and it’s just got bigger and better! This course can be binge-watched all at once, or you can go through it step by step (there’s implementation to be done within each module) The beauty is, you can go at your own pace. To grab instant access to the course, click the button below and read all about Sales Success. Don’t just enjoy the view. Be a part of it.